When I build gardens for people I try to instill something into my designs that reflects or encourages reflection in the people who use the garden. It is not a new concept by any means. Gardens have evolved in response to a desire to transport the person experiencing it to another realm. Our minds interpret what the senses inspire based on what we know. If it is something new to us and our minds are open to expansion, our world gets larger and we become potentially wiser. Consciousness is basically what we are thinking in the moment, where our mind is wandering, what we are contemplating. Gardens have the ability to alter our state of being, creating chemical responses that literally change who we are both mentally and physically. Beauty is beneficial. But what does it all mean? When I give my lectures I frequently talk about the concept of triggering conciousness. If a person is aware of the meaning of something then having the senses drawn to those thoughts can alter our mood, our path, and our actions. 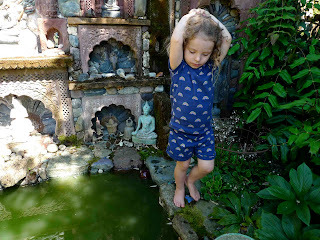 So when I am building a garden for a client or myself I try to instill allusions to favorite memories, peace, sanctuary, divinity, pleasure, and the wonder of nature. A trickle of water can take you back to a courtyard in an Italian garden you once visited, or for me, a rivulet of water in an alpine meadow filled with wildflowers. A well designed path makes you aware of your footsteps perhaps like skipping across a stream on stones. The smell of lilacs takes us back to our childhood, maybe even to your Grandparent's garden. The smell of petunias does that for me. My grandfather filled old washing machine tubs with them. I have 3 of those tubs in my garden to remind me of him. My garden is filled with triggers to memories of travel. Being extravagant, I built a version of a Maharaja's harem from a palace in India in my back yard to transport me back to the country I was once obsessed with and returned to 6 times. 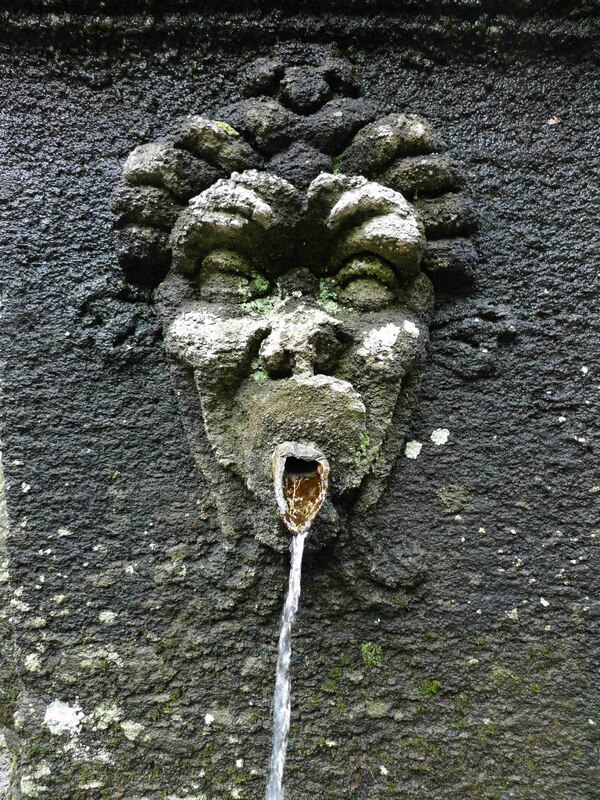 It is also a sacred grotto where the well spring of life emerges from a holy mountain. I use an image of a painting by the artist Nicolas Poussin that I saw in the Prado Museum in Madrid in my lecture on the Pleasure Garden to tell the story of the sacred grotto on Mount Parnassas in Greek Mythology. 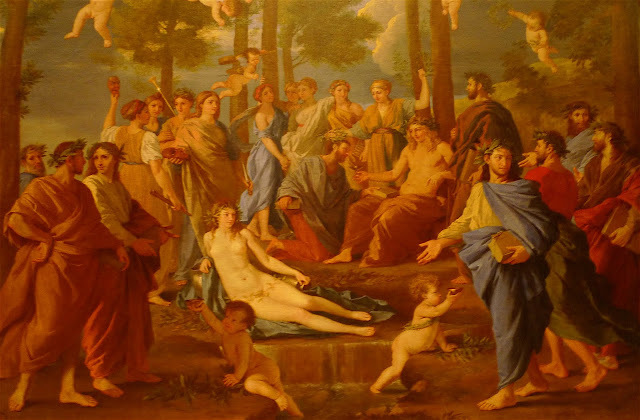 In the painting, the Sun God Apollo offers a chalice filled with the Nectar of Immortality to the poet Homer, surrounded by other divine figures and Nymphs and the Muses of the arts, music, and poetry. Through intention I have created a sanctuary to reside within that conciously draws me in to the world of the divine. 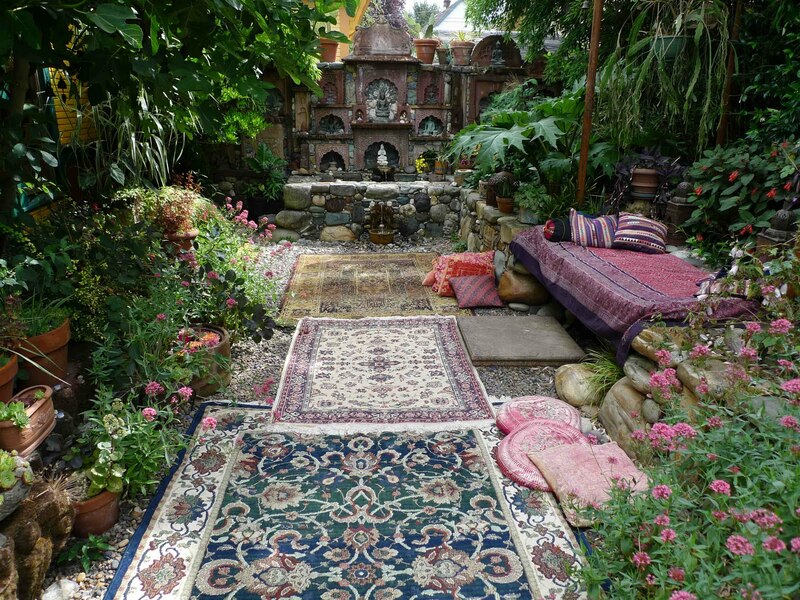 I need this sanctuary to cope with the vageries of the man made environments of America. Parking lots and freeways make me sad. The Earth is sacred and should be treated as such. My travels are manifested in design throughout my garden. The colors I painted my houses remind me of temples in Nepal and Thailand. A rattlesnake mosaic path between my houses has numerous allusions. They remind me of Precolombian carvings on Mayan temples in Mexico, and of encounters with live snakes I have had in the desert (I love them). It is a symbol of strength, the shedding of skin and renewal, and protection for my home. The staircases in the temples of the Angkor civilization were always flanked by 7 headed cobras, called Nagas, which repelled energy that is not divine from entering. 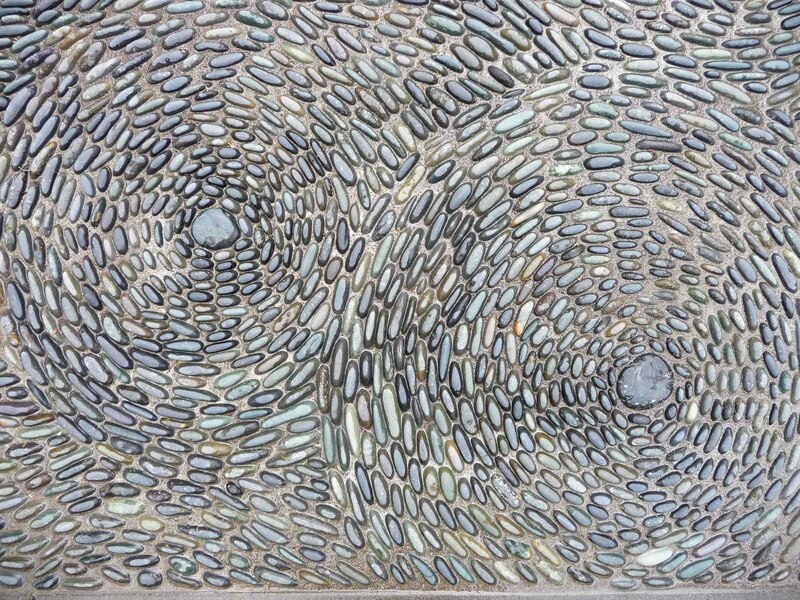 Creating pebble mosaics allows me to be pictorial when I represent symbolic ideas. I remember the places I gathered the pebbles and am transported back to the beaches and streams I collected them on. The entrance to my garden is a mosaic of a pair of eyes, mine actually, watching over the entrance. All who pass over it are being watched by me. It is like a symbolic security system, far more appealing than paying money to install an alarm system. Nobody has broken in so far. The eyes are styled after those painted on stupas in Nepal with a third eye set in the forehead, representing a connection to higher conciousness. The third eye is an ammonite fossil I found in the Kali Gandaki river, the deepest river valley in the World. I think of Nepal when I walk over it, and the idea that I should be mindful and even transcendent is brought to forefront. Two steps up from my eyes is a Tibetan Endless Knot, which represents the infinite potential that we possess and seldom reveal to ourselves or the world around us but is a miraculous and freeing idea to contemplate when making decisions. Above the mosaic is a steel arch, which was modeled after stone arches in the Meherangahr Fort in Jodhpur, Rajasthan, India, a place I spent a lot of time and hold dear to my heart. It was the source of many of the carved sandstone pieces built in to the wall in my grotto, which were salvaged from demolished buildings. A perspective view of the wall I built in my garden, a blend of the many architectural wonders I have visited in my travels, and stones collected from rivers and beaches all over the world. I built a path for a client of stepping stones that have mosaic mandalas in the form of a lotus in the center of each one. The idea came from the Jataka tales, or stories from the life of Buddha. When Buddha was born, it is said that lotuses sprung from the ground at his foot steps as a baby. So when you walk down this path it is possible to walk with mindfulness. Buddha's footprints are an important symbol seen in temples throughout Asia. When building a fire pit in the garden of Dan Hinkley at Windcliff in Indianola, Washington, I used a totemic image of a Giant Pacific Octopus. Dan had been inspired by a Council Ring at Martha Stewart's home Skylands in Maine. This was the former estate of Edsel Ford. Jen Jensen, a highly influencial landscape architect from the midwest designed many gardens for the Ford family and frequently created places for people to gather around a fire with a curved round seating area, which were called Council Rings. One of these had been designed for Skylands but never installed, so Martha had one built in cut granite. The one that I built for Dan and Robert at Windcliff is a similar form, but with influences from Northwest Coastal Indian culture combined with Hindu cosmic orientations. I built the ring so that you enter from the east, the direction of the rising sun. Straight ahead is Mt. Olympus, the tallest mountain in the Olympic Mountain range, so there is the divine link to this holy mountain in Greece. The Octopus's body is the fire pit itself. The 8 arms point in the cardinal directions like a compass, as the Sound below the property is a major shipping canal. 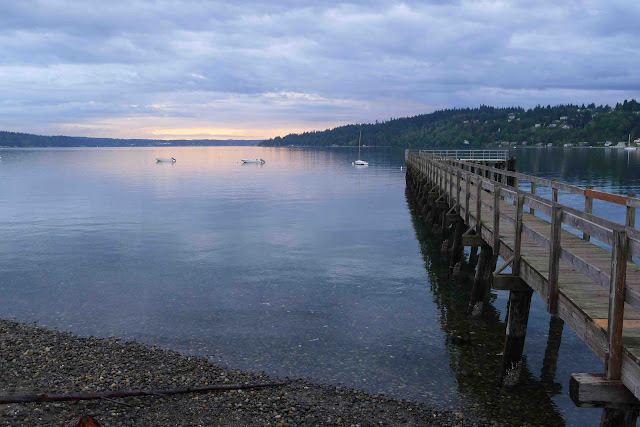 I gathered all of the stone from the beach below the property to create a link to the sea. The colors in the mosaic change with the directions in the circle to relate to the seasons and the cycle of the year. There are lines in the mosaic that mark the position of the sun during the summer solstice so when the Earth makes a full circumambulation of the sun it will line up with those markings at sunrise, noon, and sunset every year on the longest day. Many holy sites all over the World are aligned to these sacred moments. The Incas had a ceremonial pillar they would tie a mythical lasso to for catching the sun and pulling it back the other way on the shortest day of the year, insuring the return of longer days. 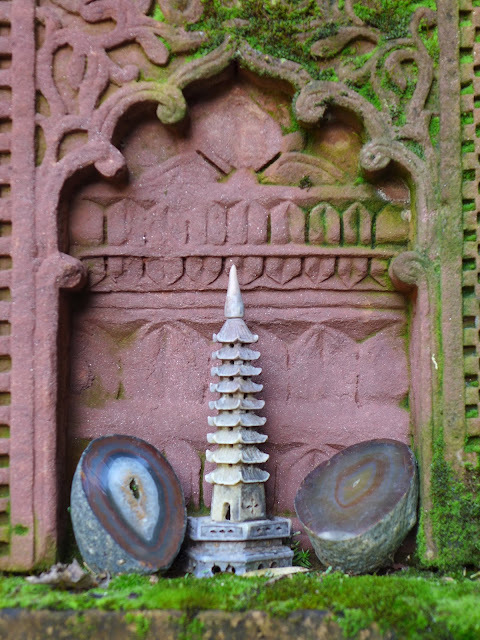 Capturing moments in the cycle of nature are recurrent themes in sacred architecture as a way of connecting to the universe. Another mosaic that I built for a client who grew up in Hawaii was designed to remind her of moonlight shining on the sea, which in Hawaiian is called an Ala Moana. When it was finished we were standing there in the dark, and the porch light on the guest house was shining across the pebbles. She gasped and said "Its an Ala Moana!" as the light cast a line across the ripple of the stones. Another couple that I worked for in Portland had spent time in Barcelona. When we were walking around the house and garden looking for ideas for a design concept, I saw a wind surfing board leaning against the house. It had a beautiful patterning of a constellation painting by the Spanish painter Joan Miro set in fiberglass. When I asked about it they professed their love for the work of the artist, and it was decided that we should create mosaics using Miro inspired designs. The first one was in the parking strip in front of the home, which has a foundation and columns built of large river rocks that came from a stream that used to flow where a street now runs. I purchased and read a comprehensive book on Miro's work and began to draw sketches of various concepts using Miro style motifs. In getting to know the clients I could see that thier lives revolved around thier two daughters. So in one of the sketches I drew an abstract woman with the moon in her hair giving birth. They loved the idea so I built the mosaic. It is edged with large stones to connect to the house and symbolize the stream that once flowed where the street is. I could go on and on with virtually every project I have built describing the reasons and meaning behind each one, and I will probably add to this post from time to time. But in the end what I am really trying to do is create beautiful memories that enrich the lives of those who experience these gardens. I encourage you to do the same. Having a good reason for doing something takes it beyond the realm of just being decorative and makes it personal and meaningful. A garden can make us more aware of the World and transport us to places we remember and love, or to new states of being we might have missed otherwise. Every year I plant a petunia, and when I smell it I am a child again in my grandparent's garden, something I never want to forget. very interesting Jeffrey, and a natural extension of the talk I recently heard you give here in Portland. I can't help but think about what kind of memories I would want to trigger in my own garden. The natural landscape of my home city, Portland. That one seems easy, the number one thing I think of when I think of plants in Portland, especially the ones I noticed most growing up would be Sword Fern. Another element from my past would be Japan, but how to evoke Japan in a garden without making a Japanese Garden? I can think of many beautiful elements from Japanese decorative arts, especially cloth and paper that could be incorporated into a garden. The result would definitely evoke Japan but wouldn't be anything like a "Japanese Garden". Sword Ferns were one of the first things I planted in my garden 28 years ago. I have snowberry and Holodiscus and several perennials that are native to the Willamette Valley in the garden. There are a lot of climactic and genus similarities between Japan and the Pacific Northwest. I think it is possible to borrow from every culture but the best way to do that for me is to synthesize that with native influences and materials. I always turn down offers to build Japanese gardens because I am not Japanese and have never spent time there, but I use a lot of rules, especially in terms of composition and placement. It is best to do what best expresses your desired relationship with nature. Stunning images! 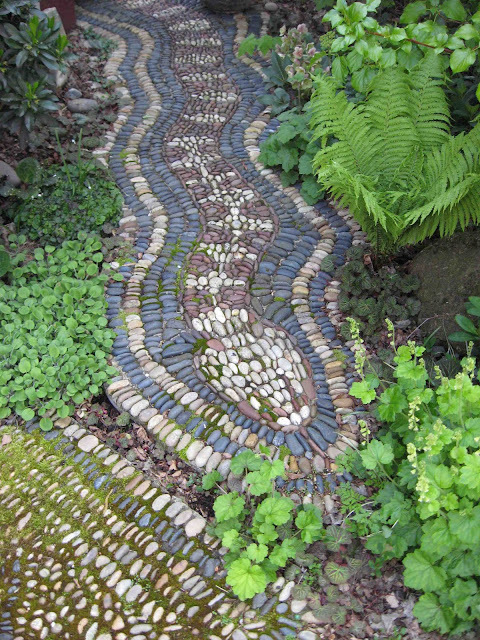 I love the snake pathway, it is very unique and beautiful. Amazing and inspirational; your talent appear to have no limits. Just a personal connection is your mention of the scent of petunias - to me it always reminds me of my father's garden, a delightful connection to the past.